First split the jalapeños in half, lengthwise. Then, with a small spoon or sharp knife, remove the seeds and veins. Wash the peppers in cold water and dry well with a napkin or paper towel. Remove the chorizo from its plastic packaging and sauté over medium heat until completely cooked. Then let cool for five minutes. 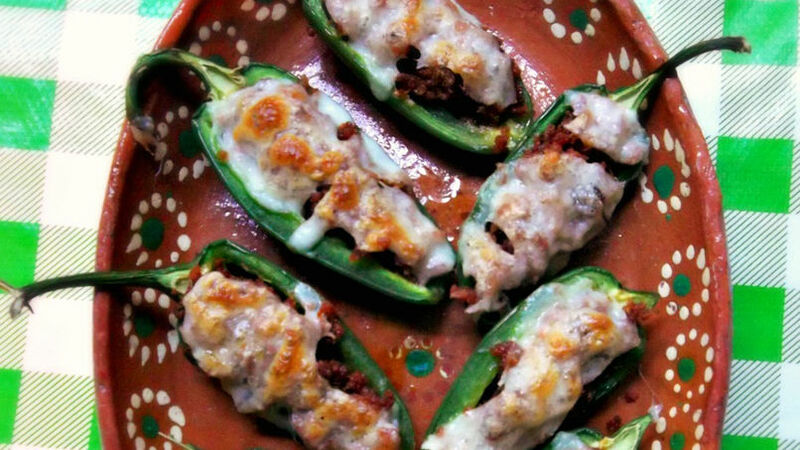 Pre-heat your oven to 350°F and fill the jalapeño halves with the cooked chorizo. Then place the filled halves over a greased baking sheet. Cover each serving with one to two tablespoons of grated cheese. Bake for 10 to 15 minutes, or until the cheese melts and begins to turn golden-brown. Disfruta! Always use plastic gloves when working with fresh peppers. Wash your hands with a mixture of soap and baking soda after handling chili peppers, to remove any spicy residue. Jalapeño peppers are famous for being very hot. Even pickled jalapeños tend to be too picante for me. I enjoy the flavor they give to a cooked dish, even though I really can’t eat them. But luckily, this isn’t always the case with fresh jalapeño peppers. This recipe of jalapeños stuffed with chorizo and cheese is one of my favorite ways to consume jalapeño peppers. After removing the seeds and washing well with cold water, these peppers are full of flavor and edible by those with even the most sensitive palates. Believe me, you won’t be able to just eat one!